Since this is Breast Cancer Awareness month I thought it appropriate to post this book review to start off the month. This book is a devotional/journal type book. Plus the author has made places where the reader may also write down their own thoughts and happenings as they too face the "C" that has entered their life. My mom had breast cancer and mastectomy about five years ago so this issue is close to my heart. I'm sure you can tell by my blog theme this month. I believe the author did an awesome job putting together this book. It is a six week ~ devotional study course, 5 days a week. The author takes the reader on her personal journey through her Cancer experience. She starts out with preparation in Week 1 setting the stage and goes on through the Diagnosis, plan, effects, responses and the rewards ~ each week. She'll help you to accept the changes and know that you are still beautiful. Allen helps the reader find hope through brokenness. This is such a wonderful encouraging book. What I'd love to do is offer my copy, slightly read for this review to someone. Here is the stipulation. I'd like it to be someone that just has been diagnosed with cancer and is starting out on the journey. You may leave me a comment or email me (my email is under my profile) and I'll get back with you. God is bigger than cancer. Karen Allen was in the midst of chemotherapy for breast cancer when she first heard those words from her pastor. Her hair was falling out and she was nauseous, yet being reminded that God is superior to any disease—even if it was taking over her life—was exactly what she needed. Designed for individual study or for small groups, this interactive, conversational guide provides practical applications for coping with cancer. It encourages readers to incorporate their “cancer world” into an unforgettable time of spiritual renewal. From the point of suspicion through the trials towards remission, this study offers biblical solutions and spiritual comfort for cancer patients, family members, friends and caregivers. Karen Allen experienced firsthand the significance of her cancer research when she was diagnosed with breast cancer while working in the Comprehensive Cancer Center at the University of Alabama at Birmingham. 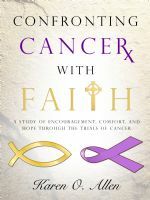 Karen has co-authored numerous articles appearing in various national and international medical journals, but it was her walk through cancer that inspired the writing of her first book offering real encouragement, comfort, and hope. Karen and her husband, George “Parky” Parker, have been married 26 years and live in Birmingham, Alabama. Though they have no children, they enjoy the companionship of their rescued canines. Karen also enjoys mentoring other women and participating in furthering the gospel in India, serving on the Board of Directors for the Transforming Leaders in Asia organization. Her mission work also includes the Native Americans in Midwest North America. At home and abroad, Karen uses her talents as a singer and instrumentalist to give glory to God through her ministry. Karen has earned degrees from the University of Southern Mississippi in Medical Technology and the University of Alabama at Birmingham in Education. Although certified as a secondary science teacher, she continues her work in cancer research at the UAB Comprehensive Cancer Center as a clinical trials administrator. New to the speaking arena, Karen hopes to develop her Ewe R Blessed Ministry by providing reassurance to those in times of crisis, especially cancer. God is bigger than cancer!! I believe that statement. I know several of my women friends who have cancer and I would love to share God's word with them through this Bible Study. It is a good study for anyone of us, male or female and parents of a child with cancer..most of all for those who have not been struck with this tragic disease. Who better to know how to pray for others with cancer or any dreaded disease. Thanks Abi for having this book and author on your blog. I'm not sure if this book is a giveaway, as I didn't see any comments...or perhaps it is over. Either way, I want to agree with the importance of this study for everyone. Thank you.